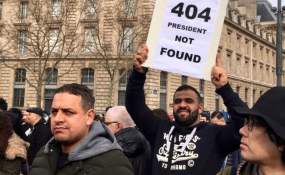 Protester brandishing sign saying 'president not found' in reference to aging and frail leader Abdelaziz Bouteflika (file photo). For 20 years, Abdelaziz Bouteflika has presided over the country of Algeria. But he suffered a stroke in 2013, and has not spoken in public for seven years. That didn't stop him from announcing his campaign for a fifth term. Amid the recent practice of offering gifts to framed portraits of the ailing Mr. Bouteflika, whom many analysts describe as incapable of running the country, an Algerian protest movement born of a feeling of deep humiliation has torn down city-hall presidential posters and taken to the streets. His proposed compromise - to serve only one year of his term, which would still allow his party to control the succession process - only inflamed those feelings. After a month of peaceful protest, Mr. Bouteflika announced that he would not run in the next election after all, opening up a range of prospects and raising numerous questions. Figures from civil society and opposition political parties saw his announcement as a manoeuvre by the powerful military and political establishment to buy time and divide public opinion. Mr. Bouteflika delayed the April 18 presidential elections, but did not mention a new date; the delay, too, is not based on any constitutional law governing the elections process. He announced that an "inclusive and independent" national conference would be tasked with preparing "reforms and installing a new system to transform the nation-state," but that does not include a concrete agenda or refer to any new methods of governance. On the contrary, this conference would officially be under the authority of a "presidential body," amounting, once again, to the executive controlling a compromised transition process. But the most important issue relates to the future of rights and freedoms in Algeria. The protest was centred around Mr. Bouteflika, but was more broadly about a repressive system that protesters want to end. And in a place near where the Arab Spring was born, there are no indications that this deep change is on its way. Algerians have become disillusioned by promised reforms that never materialized. In the 1980s, Algeria experienced a phase of liberalization in its political space, following popular movements such as the 1988 uprising, but the interruption of the election process in 1991, and the ensuing civil war, put an end to these reform efforts. And in 2011, in the wake of the Arab Spring, authorities used several ploys to nip the popular uprising in the bud, including buying civil peace by redistributing money from oil revenue and promising to open up public space to pluralism. But instead of preparing a truly democratic platform, the 2012 laws, particularly the law on non-governmental organizations, contributed to closing public space even further. Similarly, the ruling class did not really respond to demands for social justice and economic and social rights - demands that have steadily increased in the context of the economic crisis in Algeria. To convince protesters that real change is afoot, the Algerian government must liberalize the space for public action and establish a new system of governance that respects human rights. It must end a continuing prohibition on demonstrations in Algiers which has been strictly enforced for almost 20 years, requiring that all requests to hold any meeting, even in hotel conference rooms, are to be submitted to the local governor for prior authorization; these are often denied when the subject is sensitive and not to the authorities' liking. Likewise, demonstrators protesting in the streets risk a prison sentence under the convenient charge of "participation in an unauthorized demonstration," which has been used over recent years to prosecute activists, especially those from social movements. The government has prosecuted journalists, bloggers and activists under restrictive laws on defamation or disturbing public order. These laws and their implementation have created an atmosphere of repression and absence of freedom that have contributed to the feelings exploding today. This huge public wave of protest aims to sweep away these practices that have often prevented any expression of popular anger. But for real, lasting change to take place - change that would represent a definitive break from the repressive practices that have alienated part of the population - it is essential for any reform agenda to rid Algeria of these laws that belong in the past and to align itself with the democratic demands expressed spontaneously since protests began. Read the original article on HRW. Copyright © 2019 Human Rights Watch. All rights reserved. Distributed by AllAfrica Global Media (allAfrica.com). To contact the copyright holder directly for corrections — or for permission to republish or make other authorized use of this material, click here.